The sixth "Play & Learn" adventure is all about natural disasters. Hexana has been on a quest for witchcraft and has ordered Don Kroko to guard the jungle island. However, Chaos soon finds itself on the island because Don Kroko finds Hexana's magic book and accidentally creates a tornado, which in turn triggers a whole series of natural catastrophes. The poor Kikurians who live on the island do not know where they can escape! Hugo and his friends Fernando, Jean Paul and the turtle Professor Schildheimer immediately rush to help the Kikurians from the worst. 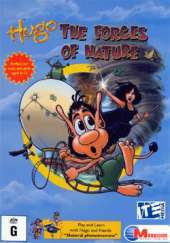 In the professor's airship, they attack the forces of nature and Don Croco's soldiers. It contains six different games that must be mastered, To save the Kikurians and the jungle island. With Don Croco's soldiers on their heels, Hugo has to free the Kikurians from the snow after an avalanche, save them from a tornado and beware that their cows do not come into contact with the hot lava after a volcanic eruption. Jean Paul is doing his best to prevent a flood, and a massive earthquake is about to destroy all the possessions of the Kikurian chieftain. Hugo and Jean Paul are arriving just in time ... And after fighting with them through the whole natural catastrophe, you can finally kill Hexana from the airship with rotten tomatoes! Save them from a tornado and be careful that their cows do not come into contact with the hot lava after a volcanic eruption.